How To Put Power, Punch And Personality Into Everything You Write. The “Oooh” Factor: Words that get the right people saying, Oooh…I need/ want/ must buy that. Australia during NYC winter, or anywhere warm. The Copy Cure, a copywriting course that’ll help you find your voice and sell your anything, is my brain- and love-child with Marie Forleo. You can get a taste of both me and Marie in this free 7-day class, which shows you how to give your copy life-saving C.P.R. As part of an online summit called Grow Your Business Live, I did a live Jam Session: a real-time, screen-recorded “copy spruce-up” — because “copy teardown” always sounds like a bummer to me — with a business called Social Brand School. (They’ve since become clients and teachers of mine: I helped them more with their copy, and they helped me get started with my new obsession, the Talking Shrimp account on Instagram.) In this video, I helped them edit their online-course sales page on the spot. No pressure! When you’re the face of your business, making it a total expression of “you” is the key to raving fans who will buy anything you sell. But how do you be more “you”? And how do you figure out what that is? Amy Porterfield and I talk about how to find out what’s unique about your personality…and infuse it throughout your brand. How do you write about yourself in a way that makes people fall in love with you, imperfections and all? Too often we think, “No one wants to know about me. I’m boring. I’m not an expert. I’m not perfect.” I talk with my friend Cathy Heller – a fabulous podcast host – about why being your flawsome self is actually what makes you stand out the most. I share the 4 essential components of writing non-sucky copy, key exercises to explore your identity, and the power of sharing more of you through your brand. To say my career path is winding is an understatement. If you’ve ever had trouble figuring out what you want to do with your life, this one will give you heart. You’ll also like it if you dig 90s references. 90210, Melrose Place, shoulder pads, baby tees under spaghetti-strap dresses…it’s all in here. Yup, Kevin brought me back for a round 2. We had instant chemistry, and by that I mean podcast chemistry so don’t even, K? I love talking about writing when I don’t have to give the usual “5 tips for copy that converts.” So refreshing. Kevin is great. And I’m not just saying that because he called me his “reigning favorite emailer.” If you want to see why, sign up for those emails here or all over this site. At some point in the evening, he invited me to be on his podcast — sweet! I felt so comfortable talking to him, I might have overshared in the interview (including a professional gaffe I haven’t made public before — see “biggest failure” section). But JLD interviews so many people every week, he didn’t realize he’d met me before till after we finished the interview. There was an “Oh, that’s you?” moment. Lesson: don’t leave your Skype avatar a blank silhouette. I could talk about money all day. 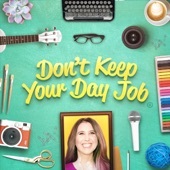 I love Farnoosh — and her podcast. In fact, we became friends because I sent her a fangirl email. Rob Marsh and Kira Hug are two of my favorite interviewers. I’ve been listening to their podcast sort of obsessively. It’s geared toward professional copywriters, but I think anyone interested in business will get something out of it. You’ll hear me talk about my no-niche niche, what I’d go back and tell my starting-out self, and how I get the confidence to edit people’s copy on the spot while they look over my shoulder. He also used a secret trick to keep my energy up. It worked. If you have a chance to meet Chris in person, you should. He’s a stellar person. Dropping science, yo. I go full-on Teacher in this one, outlining the Copy-Cure-style C.P.R. framework for breathing life into your copy. If you learn better with your eyes, see the Copy Cure link at the top. If you learn better with your ears, this one’s for you. And if you learn better with your hands, I’m working on a Playdoh version. Not really. My lord, you’re literal. Articles I’ve written or have been interviewed for in places like Forbes, Business Insider, Money, etc. You can google around and find these older podcasts, if you’re that determined. Ready to take this one-on-one? As in, work together? Get yourself an hour here.